Mildred Howard (born 1945) is an African-American artist known primarily for her sculptural installation and mixed-media assemblages. Her work has been shown at galleries in Boston, Los Angeles and New York, internationally at venues in Berlin, Cairo, London, Paris, and Venice, and at institutions including the Oakland Museum of California, the de Young Museum, SFMOMA, the San Jose Museum of Art and the Museum of the African Diaspora. Howard was born in 1945 to Rolly and Mable Howard in San Francisco, California, and raised in South Berkeley, California. She received an Associate of Arts Degree and Certificate in Fashion Arts from the College of Alameda in 1977 and an MFA in 1985 from the Fiberworks Center from the Textile Arts at John F. Kennedy University that was located in Orinda, California. Howard's parents had an antiques business and were politically active in labor unions, civil rights struggles and other community issues. Howard has lived in Berkeley since 1949. She was a member of SNCC and CORE and participated as a youth in protests against segregation in Berkeley schools. Howard began her adult creative life as a dancer, before working in visual art. In the early 1980s, Howard's installations took the form of manipulated windows from storefronts and churches. They later evolved into constructed habitats that provided walk-in environments. For example, in 1990 Howard created a house made of engraved bottles and sand in the atrium of the Afro-American Museum in Los Angeles; this work was inspired by the book Autobiography of an Ex-Colored Man by James Weldon Johnson and makes visual reference to the bottle houses that Johnson describes in the book. In 2005, she fabricated and installed a house made of red glass at the Museum of Glass in Tacoma, Washington. Howard has created numerous public installation works in the Bay Area, including Three Shades of Blue, a collaboration with poet Quincy Troupe on the Fillmore Street bridge, and The Music of Language on Glide Memorial's family housing building on Mason Street, both in San Francisco. In 2017, a rent increase forced her to move out of the Berkeley (CA) studio where she had lived and worked for 18 years. In 1991, Howard received the Adaline Kent Award from the San Francisco Art Institute for her installation Ten Little Children (one got shot and then there were nine), a work representing a cemetery inspired by the Soweto massacre. She has been the recipient of two Rockefeller Fellowships to Bellagio, Italy (1996 and 2007); the Joan Mitchell Award; an NEA Fellowship in Sculpture; and the Flintridge Foundation Award for Visual Art. In 2011, Howard was honored at Berkeley City Hall Chambers where Berkeley mayor Tom Bates officially declared Tuesday, March 29, 2011 to be Mildred Howard Day. In 2012, Howard received a SPUR Award, described as San Francisco's "largest and most prominent annual civic award", from the San Francisco Planning and Urban Research Association. In the late 1990s, Howard was selected by Alice Waters to serve as executive director of The Edible Schoolyard, Waters's garden at Martin Luther King Middle School in Berkeley, which offered middle school-aged youth hands-on education in the garden and the kitchen with a focus on sustainable agriculture. Howard has also managed an art and communities program at the Exploratorium in San Francisco, California, has worked at Alameda County Juvenile Hall and in various Bay Area jails, and has served as a cultural ambassador to Morocco, where she gave a series of lectures sponsored by the U.S. State Department. She has taught at Stanford and Brown Universities, the San Francisco Art Institute, and the California College of the Arts. In 2018, Mildred and her mother, Mable Howard, were the focus of a 26-minute documentary titled: Welcome to the Neighborhood, that examined the conditions surrounding an African-American family facing gentrification and a housing crisis that threatens South Berkeley's diversity. Over the course of four decades, Mildred Howard has created rich and evocative work, taking common objects of daily life and infusing them with a spark that illuminates the underlying significance and historical weight of cultural forms. In freestanding sculptures, wall-mounted musings, graphic explorations, and representations of shelter, she has developed a language to address racism, injustice, need, and compassion. What sets her work apart from much politically engaged art is its grace and elegance. Mildred Howard takes full advantage of the latitude that modernism won for artists in the use of materials and expressive idioms. She has used photographs, glass, architecture, housewares and other found objects of all kinds. Because she maneuvers so freely within the conceptually soft borders of 'installation' work, people tend to think of her as a sculptor, but she prefers the vaguer, more open term artist. Howard ... has worked in assemblage, collage and installation for more than a decade, but her real medium is memory, which permeates her work with vitality and poignancy. King-Hammond, with an introduction by Leslie (1995). "Mildred Howard". Gumbo Ya Ya: Anthology of Contemporary African-American Women Artists. New York: Midmarch Arts Press. pp. 112–113. ISBN 978-1-877-67507-2. OCLC 32157945. ^ a b c d Baker, Kenneth, "Artist Intrigued by Interaction of Materials, Ability to Revise at Will", San Francisco Chronicle Friday, February 9, 2007. ^ a b c "Mildred Howard: Biography," Nielsen Gallery website. Retrieved April 2, 2013. ^ a b Garchik, Leah, "Counting the ways to say 'I love you'", San Francisco Chronicle, March 24, 2011. ^ a b "Mildred Howard Day, March 29", Magnolia Editions Blog, March 24, 2011. Retrieved April 2, 2013. ^ a b c Whittaker, Richard, "This Larger Thing in the World: Conversation with Mildred Howard", Interviews and Articles, Works & Conversations, January 28, 2000. Retrieved April 2, 2013. ^ "Mildred Howard - Abode: Sanctuary for the Familia®", ArtBabble. Retrieved April 2, 2013. ^ "Mildred Howard's Blackbird in a Red Sky (a.k.a. Fall of the Blood House," Museum of Glass website. Retrieved April 2, 2013. ^ "New Installation by Mildred Howard," ArtSlant. Retrieved April 2, 2013. ^ "Glide Memorial," Art and Architecture SF. Retrieved April 2, 2013. ^ Whiting, Sam, "Berkeley’s beloved homegrown artist Mildred Howard priced out", San Francisco Chronicle, January 6, 2017. ^ "Art of Social Change: Mildred Howard visits CSUMB Oct. 25" Archived 2012-11-02 at the Wayback Machine, CSU Monterey Bay website. Retrieved April 2, 2013. ^ "Silver SPUR Luncheon" Archived 2013-03-23 at the Wayback Machine, SPUR website. Retrieved April 2, 2013. ^ "Mildred Howard", Joan Mitchell Foundation website. Retrieved April 2, 2013. ^ Bulatskaya, Aleksandra, "Artist: Spotlight: Mildred Howard", Artious. Retrieved April 2, 2013. ^ Taylor, Tracey. "'Welcome to the neighborhood': New film shines light on a changing Berkeley". berkeleyside.com/. Berkeleyside. ^ Selz, Peter (December 2015). 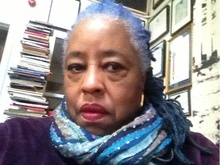 ""Spirit and Matter: A Conversation with Mildred Howard"". Sculpture Magazine. ^ Ollman, Leah, "Mildred Howard at Porter Troupe", Art in America, March 1998. Artist video interview, "Mildred Howard’s houses hold memories", SFMOMA, 2015. Article: "Why Mildred Howard wields 130 butcher knives for art", San Francisco Chronicle, March 2015. This page was last edited on 1 January 2019, at 21:38 (UTC).